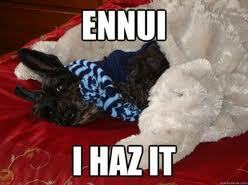 I’m possessed of an ennui I simply cannot shake. I have become drawn to bonbons and soap opera, trashy novels and naps, Masterpiece Classics and housekeepers. Ambition? What’s that? Goal-driven determination? A phrase without meaning. Apathy is a resource without limit. The bonbons will make me fatter. The soap operas will make mush of my brain, as will the trashy novels and naps. The Masterpiece Classics will change my Southern Accent to a bad British one and the housekeeper will make me lazy….as if I can afford one. I suppose the house will just remain dirty. Yes, soon there will be anarchy. No dinners, no groceries. The laundry will pile up. The bills won’t be paid. The licenses won’t be renewed. Taxes will become delinquent. Insurance will lapse. Is there a drug for this? Prozac? Nah. How about pot? Nah, the bonbons would be more appealing. Huey Lewis wanted a new drug. Perhaps I could send out a chemical alarm requesting research and development. We could make a big pharma richer than before.